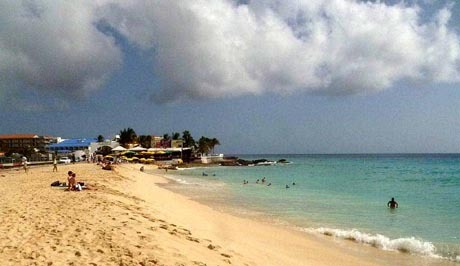 A chance to see my two youngest brothers presents itself and my husband Max makes reservations to stay a week on St. Martin island. 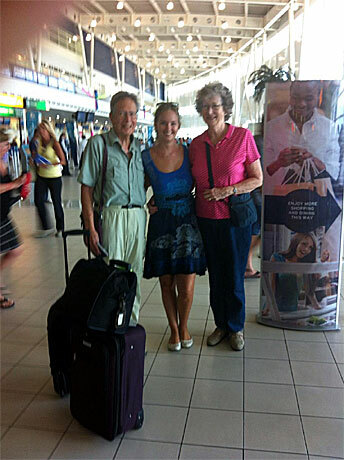 Frans and daughter Kimberley meet us at Juliana airport. 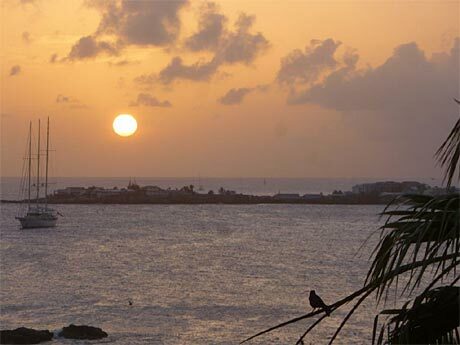 It is decided to rent a car because ´Gemini´ is berthed too far away from the Simpson Bay Resort where we are staying and it is a lot easier to get around the island. The next day we visit the marina first since we have never seen the Gemini. She has a perfect spot with a view of the lagoon from the stern. We marvel about how long the boat is and how tall the mast and think how it would look with the sails up. There is a beautiful sunset and a light breeze to keep us cool enough. ´Lagoonies´ is a bar at the entrance of the docks were we have drinks and tapas. 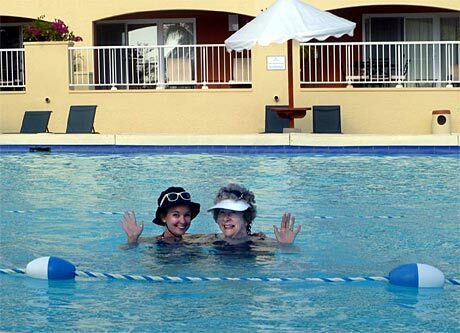 Kimberley, having lived on the island for about three years, knows the way around even at the large resort we are staying. The apartment is on the 4th floor, is newly furnished and has a complete kitchen. 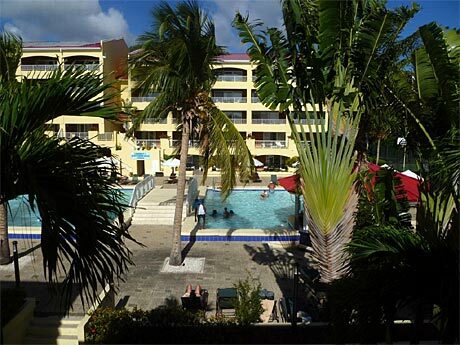 The balcony looks out over Simpson Bay and the Caribbean Sea and on the other side we look down on the large swimming pool and a shallower pool with a swim-up bar. Breakfast each morning at Alexander´s Kitchen is a leisurely affair with super slow service. But who cares? 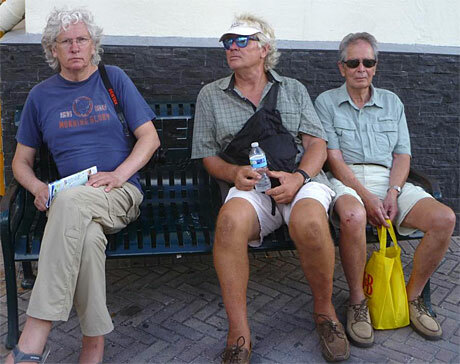 It is the island way and we like to watch the excursion boats leaving. Robert arrives the next day, Kimberley squeezes between ´oom Max´ and ´tante Mary´ in the back seat, even buckles us in every time and gives constantly driving directions to Frans. 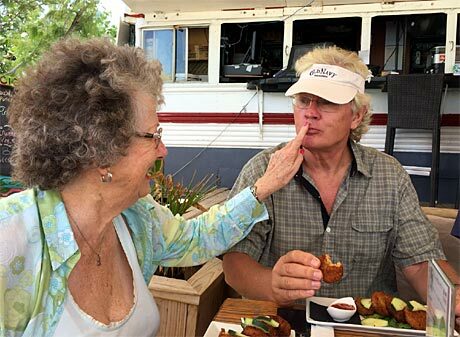 If it wasn´t for her we wouldn´t have seen so much of the island and she knows the best places to eat! 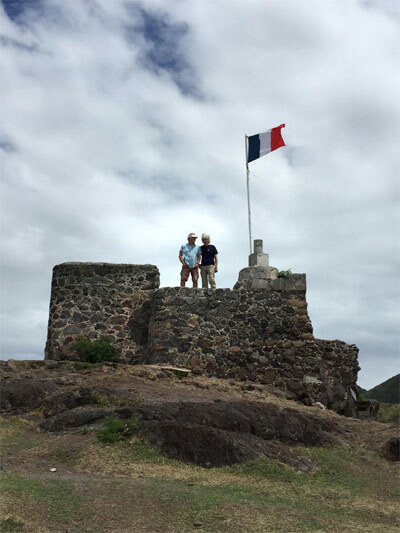 We take a day to drive all around the island, crossing the border to the French side. The main town is called Marigot and it is market day. It is all very colorful but closer inspection shows that all sell the same wares. 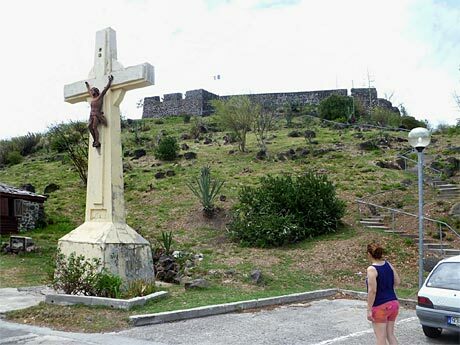 There is an old fort on top of the hill called ´Louis´, either after Saint Louis or King Louis. It is worth the climb. Lunch is at a French café ´Serafina´ on the main street. 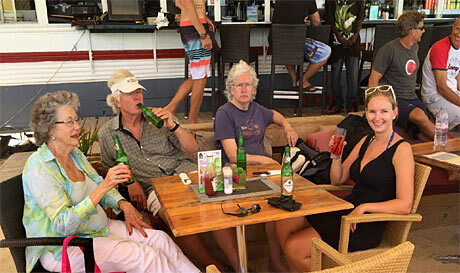 On Orient Bay Beach we stop for a ´Presidente´, the local beer. Kimberley tells us that at the other end is a famous ´clothing optional´ beach (very French). O, well! 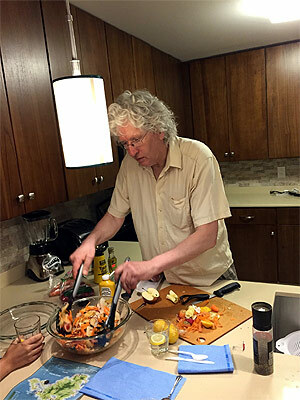 Robert agrees to cook in our kitchen and we are having a good time watching him making healthy salads. Sunday lunch is at ´Karakter´, an old school bus that serves, among other good things ´bitterballen´, it has been a long time ago we tasted those. 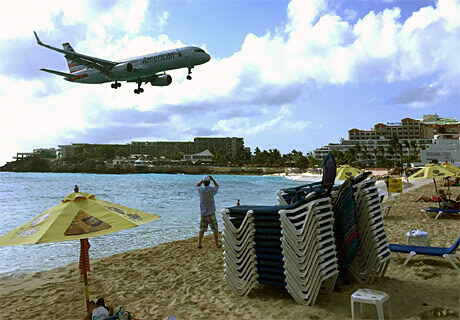 One of the things to do on a Sunday is going to Maho Bay Beach at the end of Juliana Airport runway. The planes make a very low approach right over the beach with lots of noise. 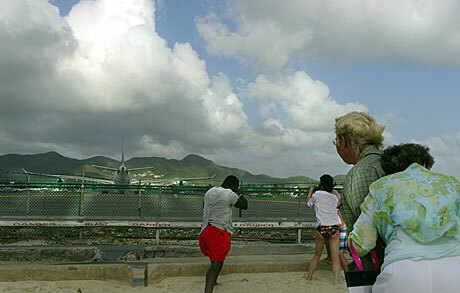 People stand close to the fence where the planes take off and get blown away by the jet blast. When a large Air France Airbus is starting take-off with its tail towards you the blast of the engines is so powerful that it is difficult to remain standing. I hide behind Frans holding on to him or I will be blown away. He claims the sandstorm took off his beard. 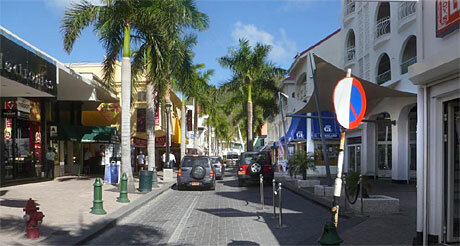 Philipsburg is the capital on Dutch St. Maarten. Founded in 1763 by John Philips, a Scottish captain in the Dutch Navy. It became a bustling center for international trade including salt mining, which was the Dutch main interest in this unique island. We saw the remnants of the original salt ponds on our tour with Kimberley. 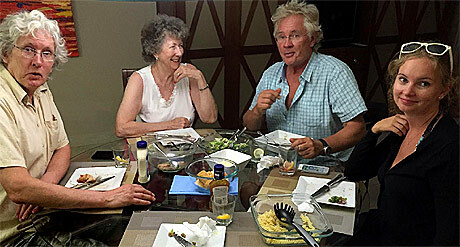 The tap water comes from desalination plants and it tastes much better than the chlorinated water at home. 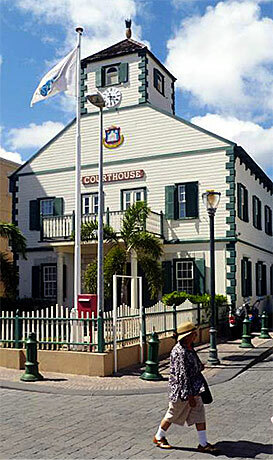 The historic courthouse was built in 1793. 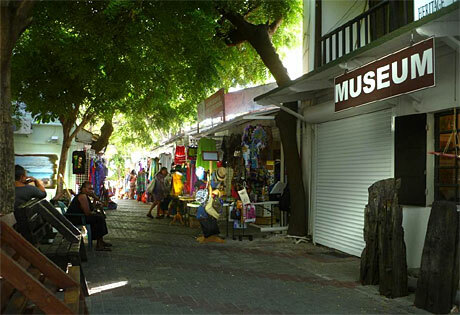 Front street is lined with shops selling jewelry, perfumes. liquor and electronics. You can bargain at most stores. 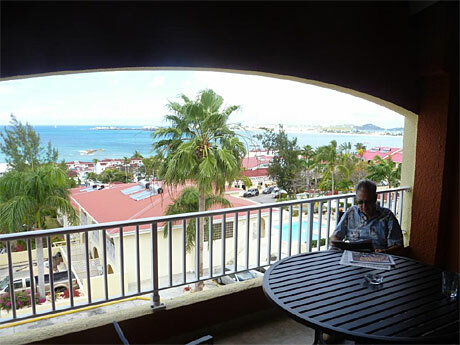 It is busy with cruise-passengers because St. Martin is a duty-free island. Front Street. Our last night is on the Gemini where we are having a good time with drinks and ´hapjes´ made by Robert. Our final dinner is on the balcony at ´Bombay Bite´ where Robert and Kimberley select delicious Indian dishes. 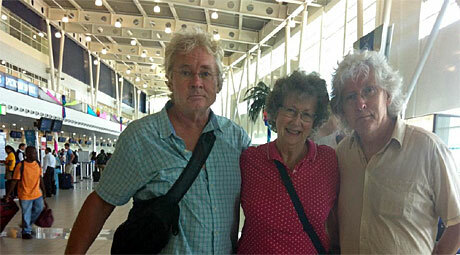 We really enjoyed being with Frans, Robert and Kimberley and wish them good luck with their future endeavors.